I was looking for chocolate chips for the cookies. I found these. Cheer! I do have Jell-o. I still don't know how much you are supposed to consume for it to make a difference in your joints. The serving size is a half cup. Give me a break. I'll eat half the blue size in one sitting. Okay, so I have to cut back. A third of the blue size per meal then? I made the cherry today. No, I did not add gin-soaked golden raisins to it. It's just straight cherry jell-o in a bowl. I don't have any gin or golden raisins. 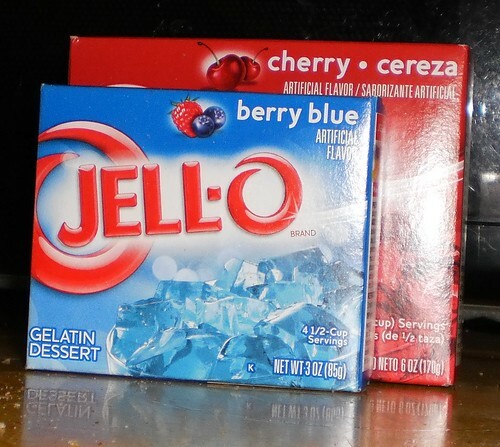 I did think about adding some dried cranberries since I have those, but I'm content to have plain red jello for meals. My friend Daniel, is determined to figure out gin gelatin. He's going to make gin-soaked golden raisins in gin-flavored gelatin. As tricky as that might be, getting the end result from Seattle to Wheaton is going to be the hardest part. I'm not fond of gin but if he can get the concoction here, I'll eat it. Too bad I don't have any instant mashed potatoes to go with my red jell-o.